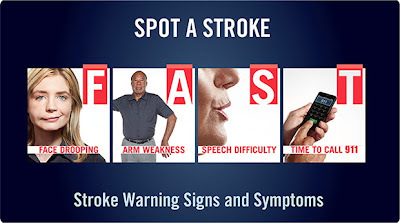 If you see any of these symptoms or the person has an difficulty performing these tests, regardless of the person's age, dial 911 immediately. "Clot-busting drugs make it possible in some cases to stop a stroke in progress and even reverse damage. But the crucial element is time. If given within three hours of onset, the drugs improve outcomes by about 30 percent." By knowing these simple things and acting quickly, you could make a huge difference in someone surviving a stroke.